The new school year has begun and the European Foundation of Human Rights (EFHR) has launched new initiatives to address pupils and students. On 15th September representatives from the Foundation started an intensive series of meetings in schools in Vilnius where children are taught in Lithuanian. 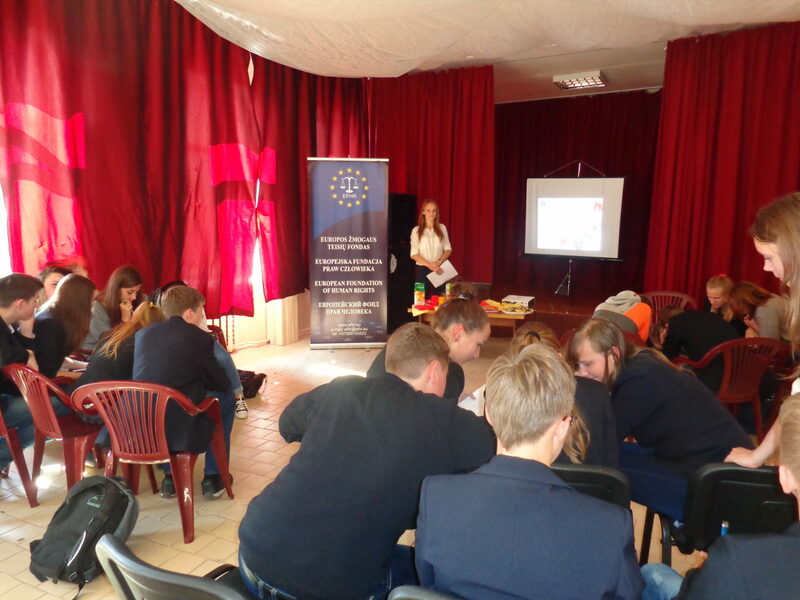 The aim of the training is raising the awareness of human rights and civic values such as equality on various levels and freedom of speech and its limits. Since 2011 the EFHR, during lectures, familiarizes students with the initiative against discriminatory comments on the Internet and tells them about the forty cases relating to discrimination they have won in the court. The participants will learn the difference between a personal opinion and an offensive comment. They will also acquaint themselves with the fines imposed in relation to writing discriminatory comments and will receive free educational material about, among others, the Council of Europe – „47 countries and one organisation… the Council of Europe”. We also want to inform you that we are continuing the “Jesteśmy Podobni” project (lit. We are alike). The first integration meeting of pupils and students from the Polish and the Lithuanian schools in Paberžės has already taken place. Twenty 9-12 graders and two teachers of both nationalities were present at the meeting. At the meeting there were pupils and students from the Saint Stanisław Kostka Secondary School in Paberžės and from the Verdenės Gymnasium in Paberžės. The participants sought aspects of history, art, cuisine, culture and politics common to both countries. There were also a lot of integration-aimed games. At the end of the meeting pupils, students and teachers were rewarded. The next meeting will be held in Rudamina. Schools willing to take part in the project are asked to contact us.